Baildon Hall is a typical example of a 16C Manor House, built by Robert Baildon in 1553, on the site of a previous Mediaeval Manor House, part of which still remain in the South Wing which dates back to the 13C. Robert was a descendant of the Baildon family who had been connected with Baildon since the 1100s. Dividing the Hall body from the wing is a 14C Oak Screen passageway, the three archways would lead to a middle staircase for the upstairs Solar wing and rooms either side. The fireplaces were uncovered during restoration work during the 1960s. Originally the South Wing was a wattle & daub structure and was not encased in stone until 1683. There is a date stone with the date and the initials of Jane Baildon who was living there at that time. The main lounge has a fine 10ft fireplace and mullioned windows. Unfortunately 3 of the mullions were removed for a doorway during the 1800s. The large cupboard door on the wall dates back to Francis Baildon’s time and would be a store cupboard, there are the initials of Francis & Jane Baildon carved on it. The letter on the wall is a copy of the letter written by Francis in 1649 claiming back his estates which were taken away from him when he was a Ward of Court, due to his father and grandfather dying when he was a baby. The panelling in the Oak Room was brought by Jane Hawksworth on her marriage to Francis Baildon in 1649. The portraits of Francis and his grandfather William are copies of much larger ones in Bolling Hall. The other two portraits are of Henrietta Wolfe, Francis’ great-granddaughter and her son General Wolfe, the hero of Quebec. The plaster ceiling is very ornate and the faces or grotesques are reputedly Charles 11, Francis was due to be knighted for his part in the Civil War but the honour was withheld for political reasons. Upstairs there is a panelled front bedroom where Francis died, very mysteriously, quite young, deeply in debt. His wife and daughter cleared the entire contents of any value and removed them elsewhere. At the opposite side of the Hall there is the South Wing which would have consisted of the kitchen and probably servants quarters. The huge oak beams on the upper floor were uncovered during restoration work in the 1980s. There is a fragment of plaster with the initials WB and 1618 which would denote William Baildon and is a design of a rough sketch of a ceiling panel. In a case there is the old game of knurr and spell, forbidden during the 16C, this was found hidden behind a wall. The Hall was lived in for many years by the Baildon Family, Francis was the last Lord of the Manor with the Baildon name to live here, his wife survived him but his descendants were through the female lines, eventually selling outside the family. After his wife died the Hall was occupied by the Stewards of the estate, then later tenant farmers. The Lord of the Manor Colonel Maude died in 1929 and his executors sold the estate including the Hall. 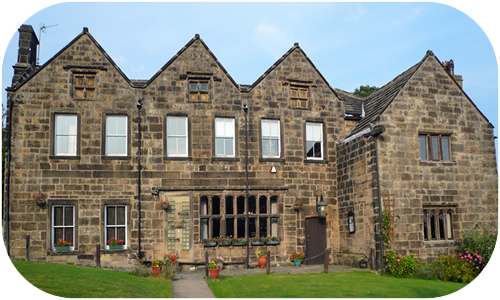 The Hall was used by the AFS as a Social Club during the War and the present Baildon Hall Club formed as a Private Members Club in 1946.The members have carried out over the years an enormous amount of restoration and maintenance. We do have a booklet detailing the History of the Hall, including the Baildon family, price £5.00 plus p&p.